I got a Capri Headmaster churchwarden from pipesandcigars.com (an exchange for a new Savinelli that had finish-bubbling issues), and this was the fourth, perhaps the fifth, time that I've smoked it. I am well aware that pipes need to be smoked 'gently' until they've broken in and built up a sufficient cake, and I'd like to think I'm a careful smoker (take very good care of my pipes; constantly looking up advice for pipe care/maintenance), so I considered this pipe still very much in the break-in stage and was smoking as slowly as I know how to. So imagine my shock when, nearing the end of this fourth or fifth bowl, I saw noticed this dark patch on the briar, and the bowl was INCREDIBLY hot -- too hot to touch. I dumped out the ash/dottle/remaining tobacco from the bowl and let it cool. But now I don't know what to do with the pipe. Is this a burnout? Is this pipe salvageable/still smokable (i.e., could I repair it or should I trash it? Is this something that requires repair?) Is this something that would be considered a defect and eligible for a return (I've read about defective pipes but don't know how rare they are; and this would be embarrassing for me, since I got this one in exchange for a "defective" return on a Savinelli; but bad luck can hit, right?). Advice and expertise, please! I've attached a photograph of the black mark on the briar and a photograph of the inside of the bowl (corresponding to the outer scarred area). The fact that the bowl was "incredibly hot" means that you were not smoking as slow or gentle as you think! Churchwardens are dangerous in this way. The smoke feels cool because it has gone 10" up the stem, but really you can be smoking much hotter than you ordinarily would, simply because you are physically removed from the hot smoke by the length of the pipe. Now, I'm saying "user error" but of course it could be a bad piece of briar - that does happen time to time. If I had to bet though I'd bet you had it hot. El Defecto strikes again . That black spot is a "Hot Spot". I have one on a pipe that happened yrs ago and the pipe is still going strong. But, either a defect or you definitly were overheating it. Only takes a bowl or 2 to create damage. If this happened to your last pipe, and again to this one, I am sorry to say mate, I believe the fault may lie with you. Don't get me wrong, but for it to happen twice in as many pipes, makes the "Factory Defect" seem unlikely. Well, shoot. Live and learn. Sad that it had to be on this pipe (I really liked the shape). Thanks for the insight, sasquatch (and you, igloo, for the laugh). Do you know if this pipe is bound burn through? I mean, should I stop smoking it, or is it still serviceable? If it is still usable, is there anything I should/could do to prevent it from burning all the way through? Yeah, nsfisher, I was afraid that I was the common denominator here. What (if anything) special did you do with your pipe that has the hot spot to make sure it didn't burn all the way through? Any idea how this will affect the way the briar ages? and moreover, that's probably the reason that your Savinelli had "finish-bubbling issues". Pipes that burn out due to material defects would probably not scorch in so broad an area. 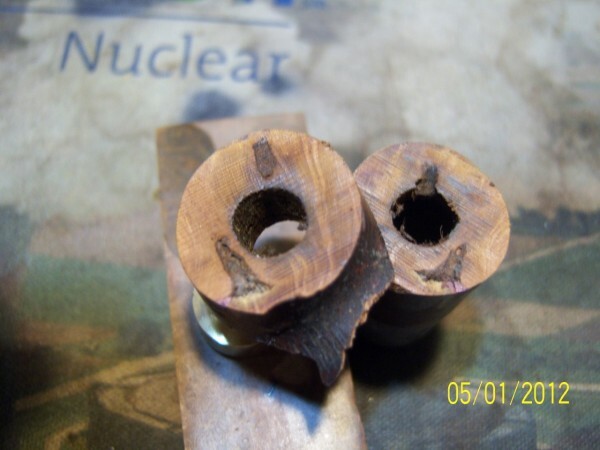 Usually, it is a sub-surface burr or knot that starts to char and burn -- a much more localized event. I would think that the charred area of your pipe has become seriously weak, and will eventually crumble and become a hole. 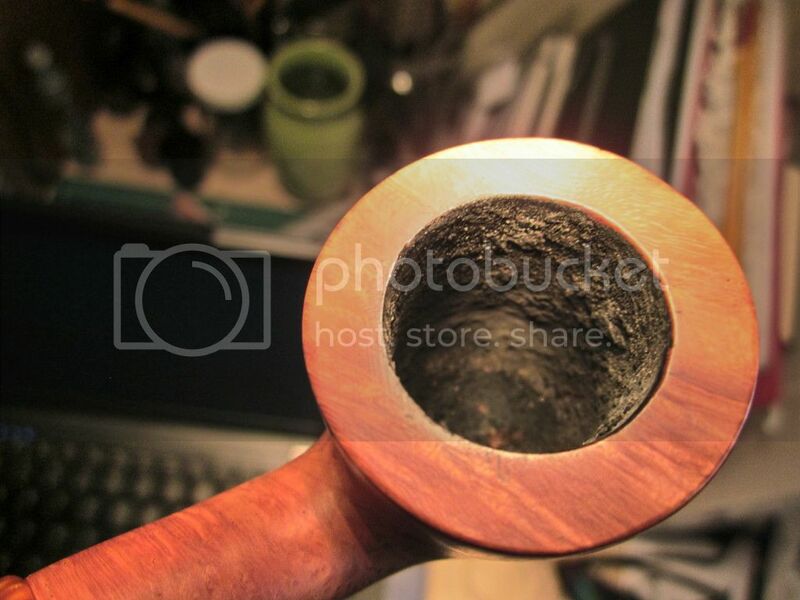 I can't imagine that you would enjoy smoking this pipe anymore since you should be tasting wood, not tobacco. So sad. Try a meerschaum pipe. 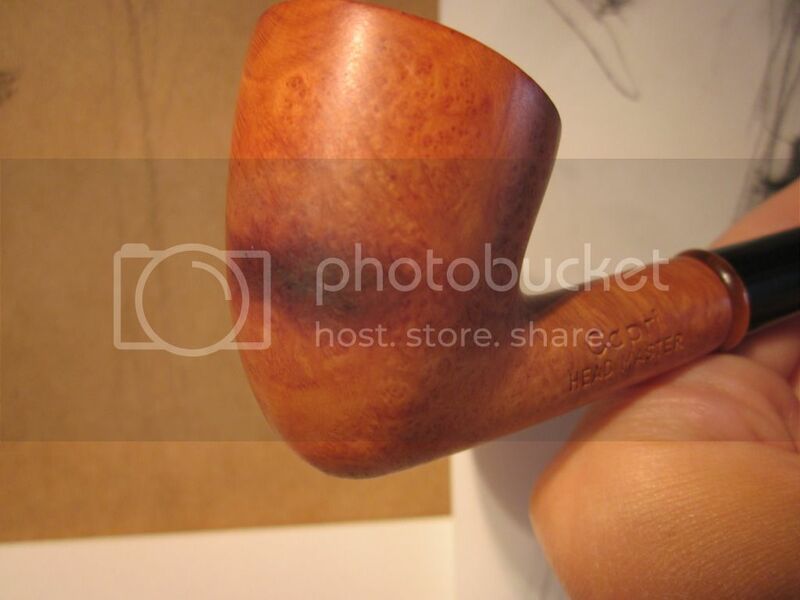 Storient can probably make a custom meerschaum Dublin churchwarden for you. You might also consider switching to a stronger, more full bodied or richer blend. the left hand column of this page. Yes mate, I do still smoke mine, but carefully. I just keep in mind not to heat it up. I can't taste the Briar but I usually smoke a cooler burning tobacco in it. It will definitly cripple or shorten the life of your pipe for sure. I haven't seen that before. But what I would do, is giving the chamber a thorough cleaning, and inspect it for signs of burning. Instead 0f the specialized mortar, would a layer or two of pipemud provide a base for a decent cake to build up? I agree with the stove mortar idea. Protect that spot, save the pipe. Why not look for a meerschaum insert. We used to get those in 5 packs to glue into briar bowls. You can find them on Ebay sometimes. Glue it in with something like JB Weld that can take a little heat. You can drill the tenon hole and chamber easily, just make sure the meerschaum plug is really wet before you drill it. The char on the bowl can be fixed by removing the wax and cleaning it with denatured alcohol. I usually boil them in water for about 20 minutes. That is long enough to get all the wax and loose char out of the wood. Sure enough there will be someone who will say, "oh man, don't do that". I do it. If it cracks, you can fix it. They usually don't crack. Briar is tough. Thats why we make pipes out of it. Once you have gotten down to plain briar, let it dry thoroughly. You'll see any cracks, veneers, other stuff you can replace. You can polish it again and rewax it. This time you'll have a meershaum lined churchwarden. I have 3 or 4 pipes with draft holes that are WAY too high, frustrating me to no end, and I have no access to cigar ashes for pipe mud. So, would the DAP/Red Devil mortar work in place of pipe mud? I'm getting tired of pipes with these frustrating draught hole issues! One is even a brand spanking new Savinelli! Now the problem is FINDING the repair mortar.....been to two local hardware stores and neither had it. One had a few Rutland products, but they seemed quite different from the DAP or Red Devil Silicate Cement. Old Cajun, this is some great advice/info. I hope I can remember it when I need it! fyrefawkes,this picture will give you an idea of why your pipe has developed a "hot spot". This os a shank of an old pipe I cut up to make a tamper from but the idea is the same. I'm guessing your pipe has the same problem. Before I cut the shank all that was visible was a small fills.Your pipe probably has the same type of flaw just under the surface. Thanks so much for your help, old cajun!!! I was hoping not to have to buy a caulk gun, but, guess I will. On the new Savinelli, the draft hole is unbelievably high! I would've sent the darn thing back, but I bought it from a seller in Holland, so that would've been a bit expensive. Hopefully, now I can fix all 4 pipes that have too high draft holes! I'll let you know how I fare! Thanks again! I think I just bought a pipe that has some sort of problem like that, but now it's too late to send it back. Can I assume all of these are the same thing, so I can use any of them? Thanks @fyrefawkes, I feel like I am pretty lucky to see this post and the photos. Thanks for sharing your experience. I haven't hurt any of my pipes, but I also wasn't overly concerned when my pipes ran hot - but now that I see what the result can be from a poor cake and break-in, I will be sure to be extra cautious with a new pipe. How did your repair with fireplace mortar work? I ask because I have gotten an estate pipe that is burned all the way through and I want to fix it. Many thanks for the info, whimsyt. I tried pipe mud first. I'm letting it cure now. If it works, cool. If not, I will try the DAP. I recently carved a briar pipe from a pre-bore pipe kit. The briar block it was made from was marked "F"
I'm suspecting that low grade briar blocks can be more susceptible to burn out, as this one got a nice chunk burnt out of the chamber on the first smoke. But that being said that's the first burn out I've gotten on ANY of my briar pipes (I have 9 in my collection). I think igloo was probably right, El Defecto, maybe a defect in manufacturing, probably a defect in the briar itself. If that were my pipe, I'd retire it, and smoke another. I know how you feel about it happening on a pipe you like, but it's likely just to get burned out more, and ruin your tobacco with the taste of burning briar. I finally wised up and started doing a cut and paste of forum entries like this into a Word file I call Pipe Tips. Whenever Tbradsim1 or Hfearly or Eajames or Rothn or Al drop nuggets like this I go into full-bore "pearls before swine" mode and start taking notes like a cranked out spider monkey. Those guys might have less gray hair than me but they walk the talk and that means something where I came from. Feel free to suggest any good posts I might have missed to add to my file, brother.